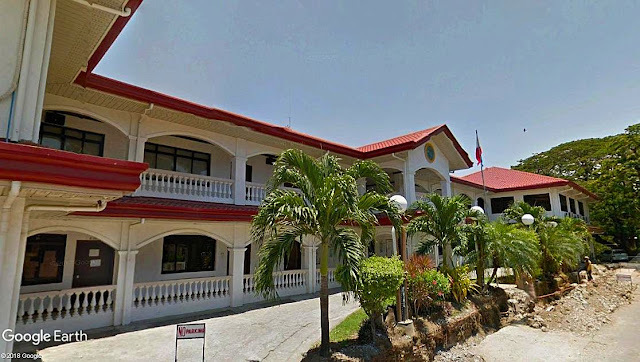 The Calatagan, Batangas Municipal Hall. Image source: Google Earth Street View. 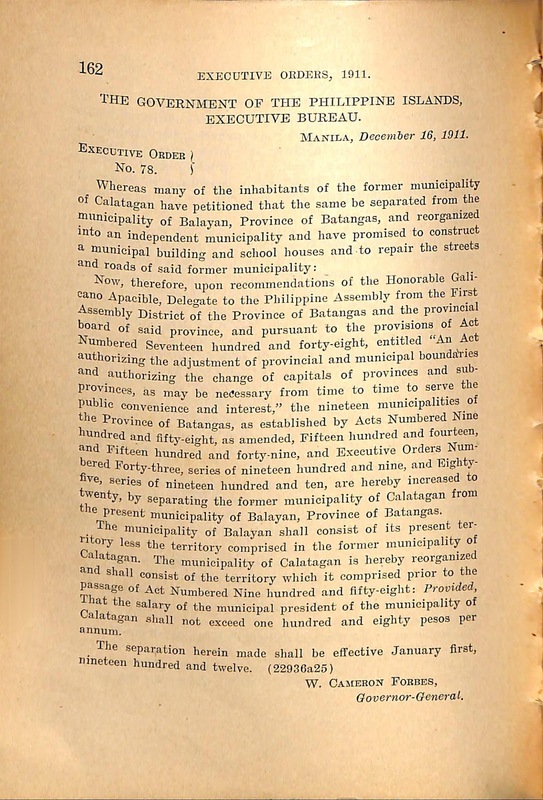 The western Batangas municipality of Calatagan was acquired from the Spanish crown by Domingo Roxas in 1829 and used to be called Hacienda de Calatagan. It used to be part of the larger Municipality of Balayan until the year 1912 when it formally separated to become a distinct town1. 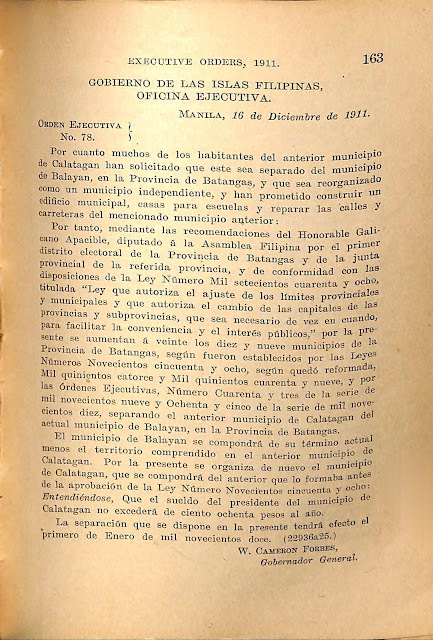 Now, therefore, upon the recommendations of the Honorable Galicano Apacible, Delegate to the Philippine Assembly from the First Assembly District of the Province of Batangas and the provincial board of the said province, and pursuant to the provisions of Act Numbered Seventeen hundred and forty-eight, entitled “An act authorizing the adjustment of provincial and municipal boundaries and authorizing the change of capitals of provinces and sub-provinces, as may be necessary from time to time to serve the public convenience and interest,” the nineteen municipalities of the Province of Batangas, as established by Acts Numbered Nine hundred and fifty-eight, as amended, Fifteen hundred and fourteen, and Fifteen hundred and forty-nine, and Executive Orders Numbered Forty-three, series of nineteen hundred and nine, and Eighty-five, series of nineteen hundred and ten, are hereby increased to twenty, by separating the former municipality of Calatagan from the present municipality of Balayan, Province of Batangas. 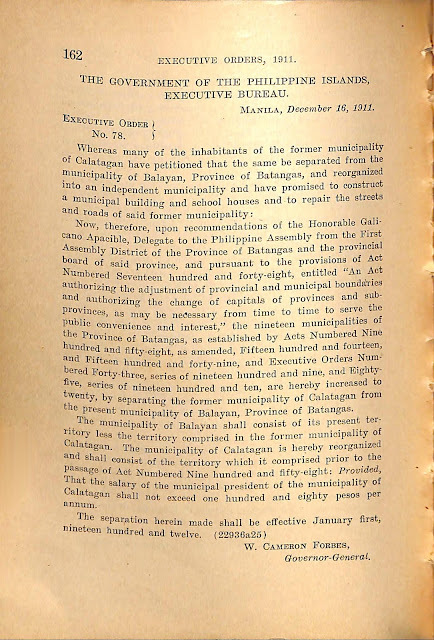 The municipality of Balayan shall consist of its present territory less the territory comprised in the former municipality of Calatagan. 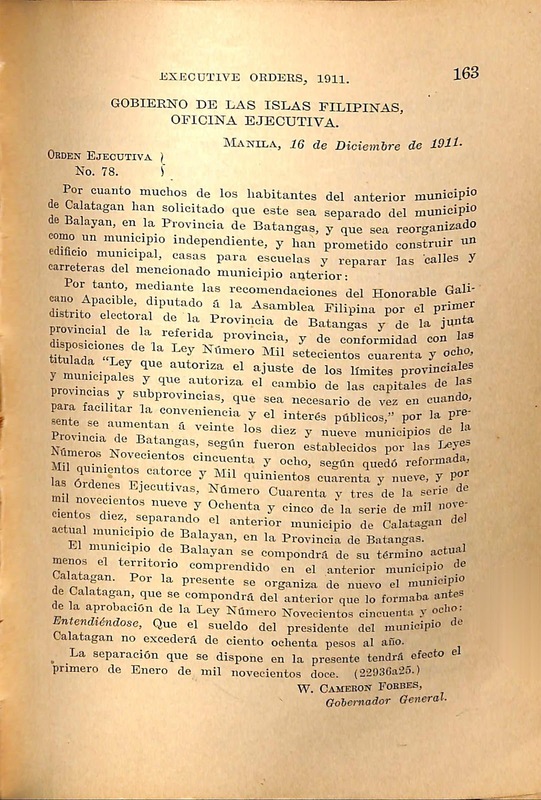 The municipality of Calatagan is hereby reorganized and shall consist of the territory which it comprised prior to the passage of Act Nine hundred and fifty-eight: Provided, That the salary of the municipal president of the municipality of Calatagan shall not exceed one hundred and eighty pesos per annum. 2 “Executive Orders Nos. 1-86 (1911),” online at the Internet Archive.